Attorney Kenneth Carp knows that unemployment hearings are more complicated than they seem. Unemployment hearings follow strict evidentiary rules even though they are on the telephone. 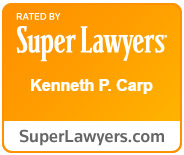 Attorney Kenneth Carp, a retired US Air Force Lt. Colonel, is well known as an employer’s lawyer. The corporations represented by him include giants such as Wal-Mart as well as local small business owners. At the Law Office of Kenneth P. Carp, our unemployment hearing attorneys are uniquely qualified to represent your interests at an unemployment hearing. After representing thousands of clients over the past 20 years, Attorney Kenneth Carp, a retired Lieutenant Colonel with the U.S. Air Force, knows the legal unemployment process extensively. He has the confidence needed when working with the government’s administrative law process. During your unemployment hearing, which will occur over the phone, there are specific rules of conduct and permissible topics of conversation. Kenneth Carp helps his clients stay on topic and well informed of what is appropriate during this important call. Hearings may vary depending on the issues, facts, documents, witnesses and other important factors. Unemployment law can be complex. It is imperative that you obtain legal representation from an experienced employer unemployment attorney who understands employment law thoroughly. Kenneth Carp can help any business, large or small, meet the required burdens to protect the unemployment tax rate. As an employer’s attorney we understand business and how unemployment impacts you. Call us at 636-947-3600 and put our continuity of care program and experience to work for you. Unemployment focused – We represent your interests.